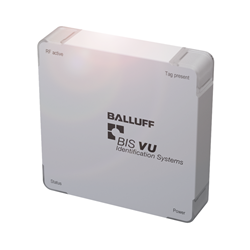 Expanding on the success of the BIS V RFID platform, Balluff recently began fulfilling orders in North America and Europe on the highly anticipated BIS VU-320 UHF reader. This reader adds Ultrahigh (UHF) capabilities to the BIS V multichannel processor which can now accept readers in the Low (LF), High (HF), and Ultrahigh (UHF) Frequencies. In addition, all three frequencies can operate simultaneously. For markets requiring flexible manufacturing principles like automotive, assembly & packaging, the ability to integrate multiple traceability applications with one processor has made RFID solutions even more cost effective and simplifies the RFID architecture. "A driving force behind the development of the VU-320 reader was the need to read tags at 1 to 3 feet away," said Wolfgang Kratzenberg, Marketing Manager for Industrial Identification at Balluff. "The typical read range of LF and HF readers is just a few inches." With most UHF readers the read range can extend out to 20 feet or more, making it virtually impossible to single out one tag on a production line. To learn more, visit http://www.balluff.com.